In an art world in which the gloss of ‘superstars’ shines brightly, Ngarra’s words seem somewhat incongruous. In the last 14 years of his life, he had a distinguished career as an artist. 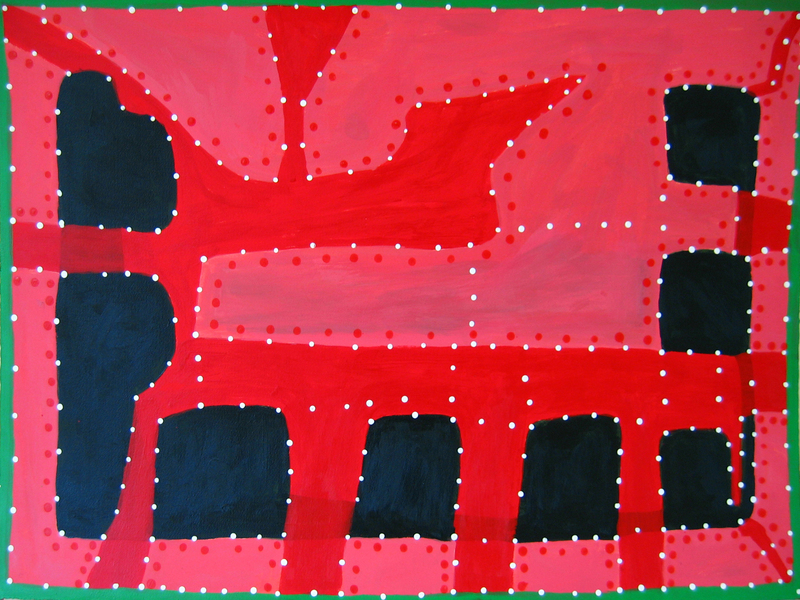 He exhibited widely throughout Australia and overseas, his works were acquired by numerous public collections and he was a five-time finalist in the Telstra National Aboriginal and Torres Strait Islander Art Awards. And yet, throughout his life, Ngarra remained something of an unheralded artistic figure, overshadowed by the success of many of his contemporaries. To his peers, however, he was a figure of singular importance, whose knowledge of culture, law and mythology were unparalleled in his generation. Ngarra was born around 1920 in the bush near Glenroy Station in the central west Kimberely region. Orphaned as a young boy, he was put to work on the stock camps, mustering donkeys, mules and horses. After receiving a harsh beating from one of his relatives, Ngarra fled the station to find his maternal grandfathers Muelbyne and Larlgarlbyne. These old men, or mananambarra as they were referred, had not reconciled with the pastoral industry. Speaking Andinyin and Kitja, they lived traditionally in the mountain country, upholding their traditional customs, laws and ceremonies. As a young man hoping to get married Ngarra chose to rejoin his station kinsfolk. Beginning what was to be a long and successful career as a cattleman, Ngarra’s bush skills made him a master stockman and drover. During the break from station life imposed by the wet season, Ngarra would walk the country with his fellow workers and lived a traditional nomadic life, attending to the ceremonies of life, death and the afterlife. In 1994, Ngarra made a simple proposition to his old friend, anthropologist Kevin Shaw; “I want to become a big artist.” Despite Shaw’s protestations that “I don’t know anything about art”, Ngarra was insistent, telling him “Well, you had better find out.” The pair embarked on a 1600 kilometre four-wheel drive journey to collect ochre from places that Ngarra had visited on foot and on horseback more than twenty years before. With Ngarra’s extensive bush knowledge they were able to collect over twenty separate colours. Later, Ngarra reflected with pride, “I had 23 Kimberley bush ochre colours. Most people only know five or ten bush ochre colours.” For his first works, Ngarra used this broad palette to decorate traditional wooden bowls known as kudi. 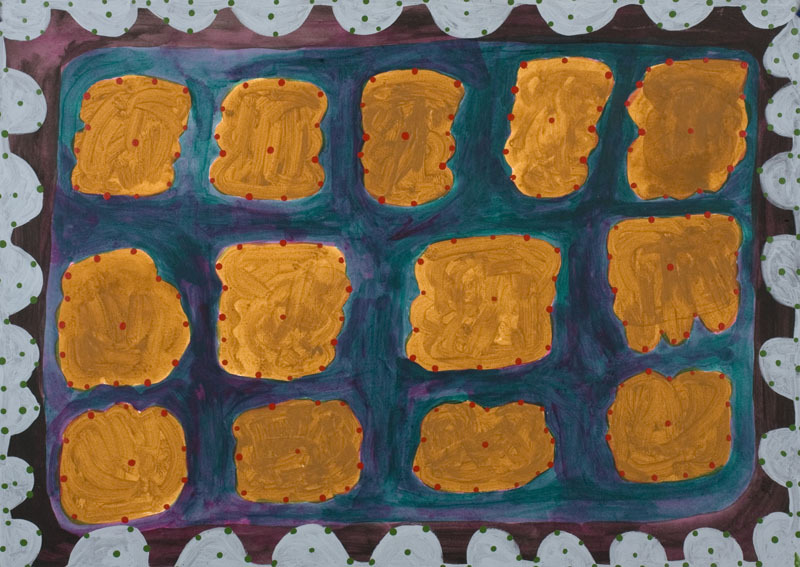 These kudi were designed along two sets of principles: the first being decorated in the ‘old style’ taught to him by Muelbyne and Larlgarlbyne, and the other bearing innovative designs that revealed Ngarra’s earliest transformations of his knowledge of the Ngarrangkarni (Dreaming), country and mythology into visual imagery. When age and illness made collecting and grinding ochres too difficult, Ngarra switched to acrylic paints, where he immediately shone as a master colourist. 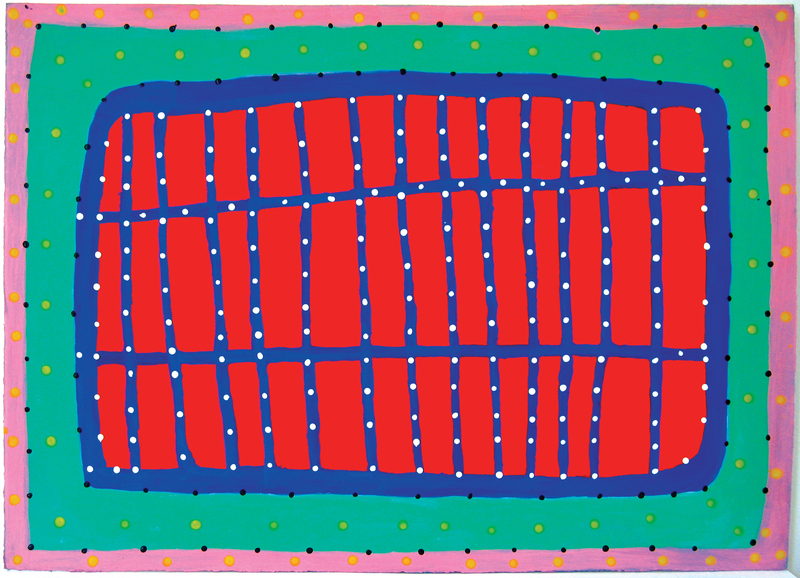 Ngarra colour-mixed his own paints to produce an endless and stunning array of colour combinations. 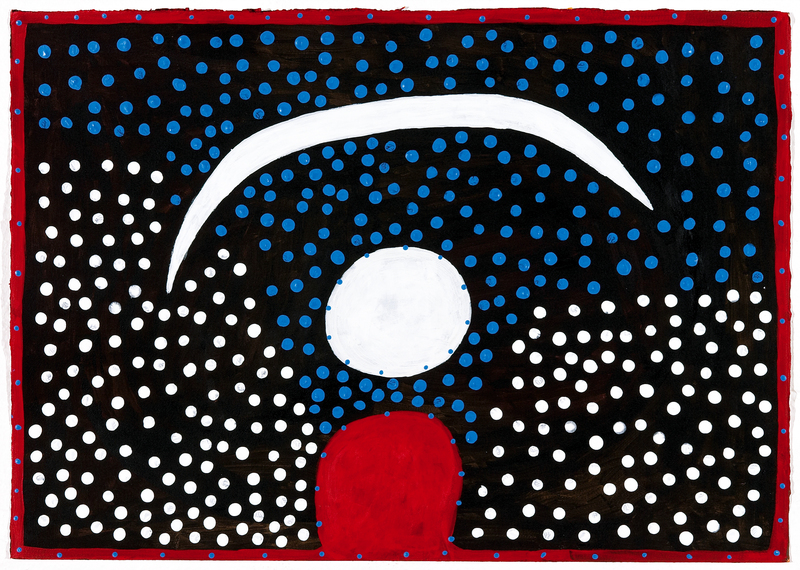 His dedication and integrity to both his art and culture inspired his peers and Ngarra became a formative influence on several artists including Mick Jowalji and Jack Dale. 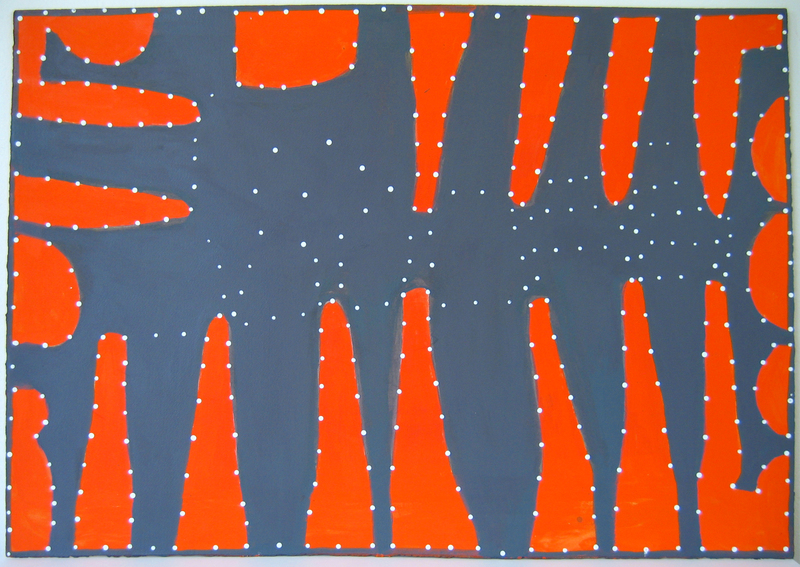 A lifelong smoker, emphysema and the weariness of age gradually restricted Ngarra’s movement and forced him to retire from painting in 2002. A lifelong perfectionist, he felt frustrated at his physical inability to make his paintings “clean and lively.” However, it was not long before he returned to his art practice, but his fragile health dictated that he restrict himself to producing small, delicate works on paper. He made the medium his own, and this late revival represented a second flowering in his career as a painter. In the final four years of his life, Ngarra devoted most of his waking hours to his works on paper, producing his most sustained body of works. 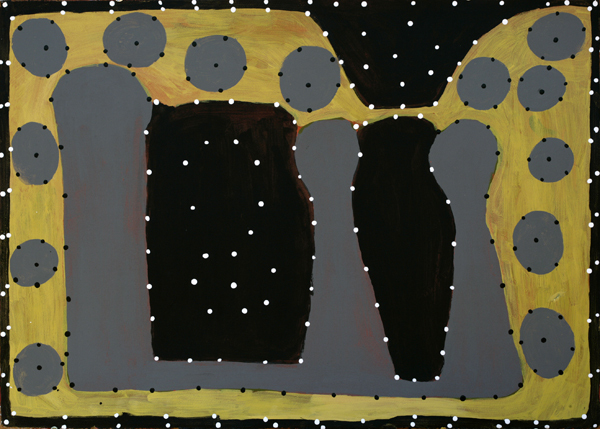 Ngarra was a unique individual: an artist whose work spoke of ancient knowledge systems, whilst maintaining an entirely contemporary vision of artistic experimentation and innovation. As Shaw noted, he was “one of the few remaining people on earth who lived through the superimposition of pastoral capital over the hunter-gatherer way of life.” This very fact gives his work a historical and cultural significance that is yet to be fully appreciated. But one cannot overlook the singular artistic vision that is reflected in his works, which sparkle with the fire of artistic experimentation. On 1st November 2008, Ngarra died peacefully in his Derby home from complications secondary to pneumonia. He left the world with a body of works whose power may take several generations to truly comprehend. It seems that no one in the art world is just one thing anymore. We are all some hybrid variation of the hyphenated multiplex artist-curator-critic-theorist-activist-historian-model-actor. While it might seem easy to account for this as the triumph of inter-disciplinarity over the modernist doctrine of specialization, the rise of hyphenated identifiers has been matched by the equally ubiquitous multiplication of new forms of specialised critical discourse. Nowhere is this more evident than in the emergence since the late 1980s of curatorship as an independent field of critical inquiry. Since 1987, postgraduate curatorial training programs have proliferated at tertiary institutions across the world, and the field of “curatorial discourse” has emerged as an accepted (albeit vaguely defined) field. The Culture of Curating and the Curating of Culture(s) by curator, artist and writer Paul O’Neill is an attempt to provide a historical account of the emergence of this new discourse, while defining the parameters of the field. Rigorously researched, at times it feels like an act of curatorship in itself; as detailed arguments and counter-arguments pile up it is sometimes hard to discern the author’s own critical voice beneath his dense survey of critical opinions. This is most notable in the book’s second chapter, where O’Neill’s conclusion seems to offer a markedly softer assessment of “Biennial Culture” than that offered in the preceding 30 pages. Nevertheless, O’Neill sketches a convincing history of the emergence of curatorial discourse as a gradual process, beginning with the avant-garde of the 1920s, gaining momentum in the 1960s, before reaching a level of global prominence in the era of the Biennial in the 1990s. Central to this narrative is a shift in agency that occurs as artists begin to challenge the autonomy of the art object, recentering art around the event of the exhibition. For O’Neill, this relinquishing of authorial control by artists was met by the rise of the curator: “curatorship emerged as a creative, semiautonomous, and individually authored form of mediation.” This is highly problematic for O’Neill, who blames curatorial discourse for “establishing, or at least bolstering, a coherent sense of agency in contemporary art production.” O’Neill is particularly strident in his criticism of the authorial role of curators institutionalising meaning within the frame of the exhibition. At this point it becomes apparent that O’Neill’s account is far more than a simple description of the emergence of curatorial discourse, functioning equally as a strategic manual for institutional resistance. As an artist-curator himself, there is something almost teleological in the way in which he positions the emergence of curatorial discourse. For if, as O’Neill concludes, all curatorial processes should be collaborative, dialogic, and open-ended, there is an unmistakable sense in The Culture of Curating and the Curating of Culture(s) that he sees this as an inevitable process of internal artistic development, shaking its institutional frames and dispersing its agency. Leaving aside the orthodoxy that collaborative processes are necessarily more challenging, democratic or open (a point that Claire Bishop takes up with some force in her recent book Artificial Hells), O’Neill’s enthusiasm for the blurred boundaries of collaborative artistic-curatorial ventures raises several objections. Firstly, despite the repeated description of curators as the authors of meaning with exhibitions functioning as texts, exhibitions do not work in the same way as written texts. Curating is not the same as writing, mostly because artworks (or any object for that matter) very rarely act like words, even when they are used like readymades to the service of a rigidly proscribed curatorial regimen. This is because exhibitions always involve a dialogic tension between the artistic and the curatorial. The problem for O’Neill, is that in attempting to position “curating as another medium of artistic production” he manoeuvres himself into a corner in which it is almost impossible for him to productively define the difference between these two forms of agency. Occupying both positions (as in the artist-curator) does not necessarily mean that the two discourses become united (that is, that the curatorial becomes artistic or the artistic becomes curatorial). The discourse of architecture does not simply evaporate in a home is designed by a builder. While I wholeheartedly agree with O’Neill’s conclusion that we need to move beyond “the level of an oversimplified antagonism, in which the practices of artists and curators are kept separate from one another,” this should not be at the expense of critically understanding the particular ways in which different modes of thought contribute towards the construction of artistic and exhibitionary meanings. Reading O’Neill against the grain, we might instead see the artistic and the curatorial as two distinct modes of agency present in every exhibition of artworks. The first of these (which for convenience we might term “the artistic”) resides within the artistic form (which is expressly not limited to objecthood). The latter (which we might term “the curatorial”) controls the mediation of these forms in space and time (again, this is not limited to physical spaces, and can include virtual spaces). Regardless of whether they are wielded by an artist, curator, artist-curator or collaboratively, these two modes are always in balanced tension. Some instances, the balance of agency will be weighted in favour of the artistic, while in other instances it will swing towards the curatorial, but both will always be present in some respect within an art exhibition. The key question in both artistic and curatorial discourse might then become negotiating this push and pull of these separate (but necessarily connected) discourses: a complex balancing act to ensure the openness of creative processes. Ultimately, this is the aim of The Culture of Curating and the Curating of Culture(s): to enable “dialogical spaces of negotiation between curators, artists, and their publics.” This does not mean that we all must become artists, but that by critically addressing different modes of thought there are new possibilities. In beginning to map out the shape and form of curatorial discourse, The Culture of Curating and the Curating of Culture(s) takes an important step towards kindling these possibilities. 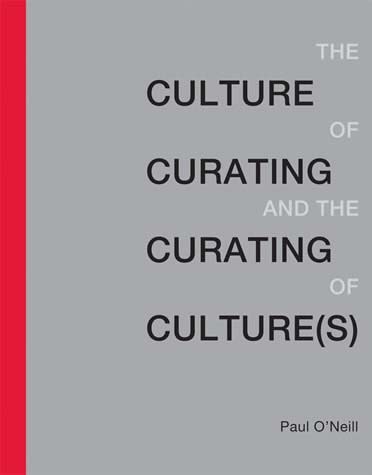 Paul O’Neill, The Culture of Curating and the Curating of Culture(s) (MIT Press: Cambridge, Mass, 2012), 4. Claire Bishop, Artificial Hells: Participatory Art and the Politics of Spectatorship (London: Verso, 2012).